Search and rescue teams were called to a building which partially collapsed in County Antrim after fears that people may have been trapped inside. About 25 families were moved from their homes in the Taylor's Avenue area of Carrickfergus after part of Ambler's Mill collapsed at about 2200 BST on Wednesday. 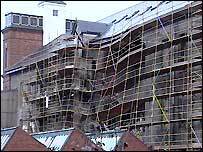 Nine fire engines attended the scene where an 80ft section of wall in the main five storey building collapsed. It was initially feared that children, reportedly seen playing in the area, were trapped, but there were no injuries. The emergency teams used a sensitive listening device and a sniffer dog to search anyone who may have been in the rubble. The former spinning mill is currently being converted into apartments and structural engineers were called to examine the state of the building. Fire officer Kevin Sinnot said the area had to be thoroughly checked. "This is an old mill, it's a five storey building and a wall had collapsed initially of about 60 metres in area - so it covered quite a large area that we had to check thoroughly," he said. Fire Service district commander Geoff White said: "During the day there would be around 13-15 site workers within the area where the collapse was. "Obviously, had the incident happened during the day there could have been a number of those people involved in the collapse with potentially catastrophic consequences." Site engineers and building surveyors are now trying to find out what caused the collapse and ensure the rest of the building is structurally sound. A Health and Safety inspector has also been to the scene to investigate what happened. Site engineers and building surveyors are now trying to find out what caused the collapse "
"The structure of the building will be examined later by engineers"